At all stages of our product life cycle we strive to use resources efficiently, we favor the use of sustainably-managed resources and target zero waste. Thanks to our advanced technologies, NUREL revalorizes the discarded nylon material, which is divertied from the waste stream during our manufacturing process, by re-converting it into Reco Nylon® yarn, thus closing nylon life cycle. All this process is certified by Global Recycled Standard (GRS) by meeting its fair labor and environmental impact requirements. 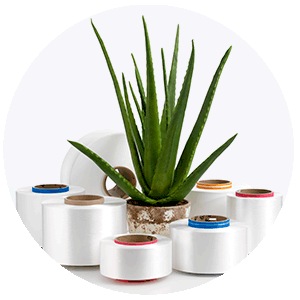 Reco Nylon is a reclycled nylon 6 yarn 100% made of pre-consumer waste. At a first stage we select and adequate the reclaimed material from all the waste generated in our textile facilities. Reclaimed material is remalted at our reclycling units in order to obtain a recycled PA6 polymer. Recovered polyamide polymer is extruded and made back into fibers at our spinning plant. NUREL is involved in examining the impacts of our products by initiating Life Cycle Assessments in order to promote sustainability of all our processes. These LCAs allow us to verify that Reco Nylon production considerably reduces resources consumption and minimizes environmental impacts. The production process of Reco Nylon takes place entirely in our facilities, thereby saving the environment CO2 emissions produced during the manufacture and transport of raw material. The production of Reco Nylon generates aproximately 9 times less CO2 emissions than a standard production of nylon 6. Reco Nylon fibers deliver similar quality and performance to standard yarns. It is available in high range from 22 to 78 dtex. 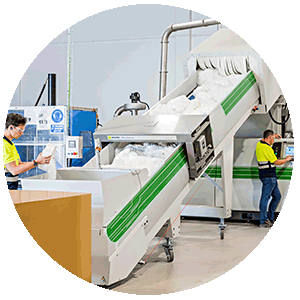 NUREL excellence in fiber production ensures an optimal performance for sustainable fabrics oriented to sportswear, swimwear and underwear. For more information about Reco Nylon product range please contact us. Do you have any doubts? Need more information?